The Work Big IN2104 is made for heavy-use with moderate-high resolution sources, featuring XGA-native resolution of 1024x768. 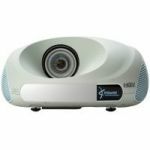 This model is ideal for users who typically connect to newer 4:3 laptop and desktop computer sources, document cameras and digital scopes to create collaborative work environments. The IN2104 will perform at a higher level than the IN2102 because every pixel on-screen is reflected from an individual mirror in the chipset, providing a larger, clearer projected image. The InFocus IN2104 DLP® projector with BrilliantColor™ technology and 5 segment color wheel displays realistic colors and brighter images that last. Powered by 2500 Lumens, the IN2100 series project bright images in high ambient light environments. The 2000:1 contrast ratio preserves detail in dark images. 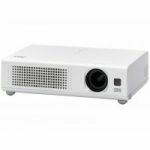 The lamp lasts up to 3000 hours and when necessary can be quickly changed without removing an installed projector from the ceiling. 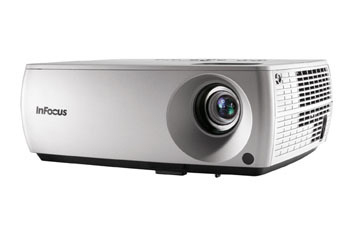 Advanced connectivity choices include multiple computer and audio inputs – so it’s easy to switch between presenters; a Wireless-Ready port for an easy upgrade to InFocus’ LiteShow II, for a less expensive ceiling mounted installation; RS232 port for integration with industry -standard meeting room control systems. 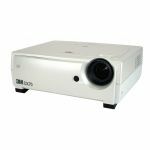 The IN2100 projectors are dust-free systems. There aren’t any fan filters or lamp screens to change, which makes for 24x7 certified operation, providing around the clock, maintenance free projection. Security – Kensington lock and PIN code feature will keep the projector in the proper location and under authorized use.